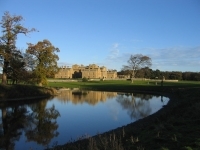 Holkham Hall is home to the Earl and Countess of Leicester, with the property being in the Coke family's possession since 1609. The formidable 18th-century Palladian Hall is the centre of a 25,000-acre estate on the north coast of Norfolk. Within the house are some magnificent state rooms, including the vast Marble Hall, which features a magnificent art collection (including paintings by Rubens and van Dyke). Visitors can also view the old kitchens that catered for the family and their enormous entourage. Within the old stables is the Bygones Museum, which displays fascinating exhibits from times gone by, including a history of farming. The Park surrounding the hall is popular with locals and tourists alike, as is Holkham Beach, which attracts sunbathers and swimmers on warm days.